Not to Touch the Earth | Theater | Style Weekly - Richmond, VA local news, arts, and events. "Scorched Earth" is a world premiere in search of a workshop. Order in the court: Jeremy Howard, David Bridgewater, Adrian Rieder and Ronnie Brown get riled up in Barksdale's "Scorched Earth." There's an old maxim of William Faulkner's that's best not to take literally: "Kill your darlings." Though the man did write "A Rose for Emily," Faulkner was referring to the portions of a text that an author hates to cut, even if it that helps the work as a whole. A fear of the scissors is just one of the problems plaguing David L. Robbins' stage adaptation of his novel, "Scorched Earth." After the body of a mixed-race infant is exhumed from a cemetery to preserve the churchyard's whites-only status, the parents of the child are left distraught. That night the church is set on fire, and the infant's black father, Elijah (Ronnie Brown), is arrested as the obvious suspect. While this exposition would imply that the play is about race, the script rarely enters into a discussion of the topic. Out of the cast of 16, only three actors are black, and none of their characters is allowed to develop much throughout the course of the show. The play instead focuses on the white characters hovering around the edges of the crime. After being goaded by the infant's white grandmother into taking the case, attorney Nat Deeds (Adrian Rieder) must defend Elijah and discover what actually happened that night, uncovering some small-town secrets along the way. While many of the scenes and characters probably work well in the complex fabric of a novel, they seem excessive in the context of a play. Does the character of Mrs. Rosy Epps (Jody Smith Strickler) really need to be seen onstage, given that Robbins' script gives the audience so little insight into her decisions or beliefs? Why is the mill boss Mr. Sipe (Lucas Hall) so important to the play's exposition, only to resurface one other time in a limited capacity? And while the medical examiner, Jackie (Margarette Joyner), is quite amusing, couldn't her role have been rewritten for Deeds' estranged wife and nurse, Maeve (Jennie Meharg), who end up helping him anyway? Aside from Rieder's excellent Nat Deeds, few of the characters are given enough stage time to be fully fleshed out. 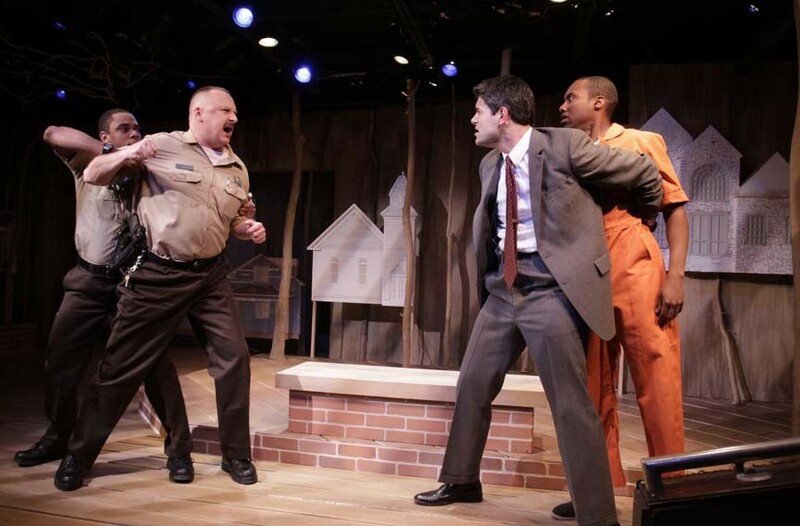 A handful — the infant's parents and Sheriff George Talley (David Bridgewater) — are allowed only to show rage or grief onstage. David Janeski also puts in a solid performance as Thomas Derby, the pastor who only seems able to speak in confessions. Steve Perigard's direction keeps a lot in motion, but has trouble balancing all the story lines near the show's end. Barksdale obviously spared no expense in this production, though some of the company's decisions seem a bit decadent. With so many smaller roles and characters that appear one time, actors easily could have played more parts to cut down on cast size. Ron Keller's set design is technically impressive, but the moving platform seems unnecessary for a courtroom procedural. Barksdale Theatre's "Scorched Earth" runs at Willow Lawn through May 20. Tickets are $19-$38. For information, go to barksdalerichmond.org or call 282-2620.